CityVue Apartments in Eagan is going green in a big way! 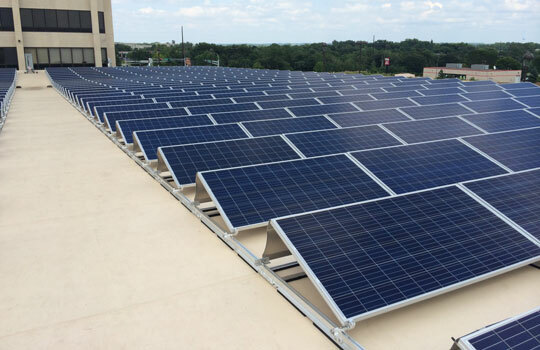 Property owner At Home Apartments is installing a 450 panel, 148 kW array on top of an adjacent parking structure to supplement power for the complex. The installation is the largest of its kind in the state and the largest overall in Eagan. At Home Apartments will be installing 14 solar projects in 2016, equaling nearly 500 kilowatts. The installations are part of a corporate sustainability push and they’re a great investment for At Home Apartments, helping lower long-term energy costs and allowing lease rates to be more competitive into the future. These systems should produce over 600,000 kilowatt-hours per year, enough energy to power roughly 140 apartment units.